You are currently browsing the category archive for the ‘Consciousness’ category. Gaussling’s 15th Epistle to the Bohemians. Thoughts of a Secularist Liberal Scientist. If you knew me personally, you’d know that as a reductionist my profile can be reduced to that of a liberal atheist scientist with marginally good manners. I broke the shackles of magical thinking in high school after reading a few books by Bertrand Russell and Carl Sagan. Though I have not been the same since, I have come to sympathize a bit with Quakers and their predilection for peace. My religious upbringing was quite ordinary for a young Iowegian lad in the 1960’s. Confirmation in the Lutheran Church (Missouri Synod) in 8th grade followed by a short stint as a reluctant acolyte. The church seemed firmly footed in bedrock as an institution and adept at indoctrinating the young. In catechism studies I tried to understand the authoritarian system that is outlined by Martin Luther and the strange collection of narratives that make up the King James Bible. There were abstractions that didn’t make sense then and are still a mystery to me today. The concept of the Holy Trinity always seemed suspiciously anthropomorphic. Then there is the crucifixion as a kind of “ghostly sorting mechanism” for salvation. It stands out against the backdrop of natural phenomena like physics and biology- mechanistic systems which seem to suffice for everything else. Finally, there is God’s seemingly endless requirement for worship and admiration which has always struck me as a vanity unnecessary for a supreme being. The whole scheme reeks of iron-age anthropology. I remember the day it happened. I was praying for something or other. Trying to have a little spiritual time with the Big Guy. It finally dawned on me that I was talking to myself and in doing so, wishing for some particular outcome to happen. All those years. Praying and wishing were indistinguishable. I’ll admit, I was never one to volunteer a lot of praise to God. Heaping praise on a deity seemed patronizing and wholly unnecessary. Surely if God could elicit wrath, then he’d certainly pick up on being flattered. Well, in the end, so what? Another tedious atheist commits apostasy. Like most people in US culture, my moral basis was built on what has been described as Judeo-Christian morals or ethics. It’s hard to avoid. But just as the earth does not rest on a foundation, I am not limited to sensibilities derived only by the sons of Abraham in a far earlier age. My culture and my brain tell me that theft, murder, and the other spiritual crimes (sins) are bad for the common good. That respect for others has a pleasurable and sensible aspect that threats of eternal damnation do not improve on. The reductionist in me can’t resist the following assertion. Deistic religion reduces to cosmology. In the end, a religion offers a theory of the universe. It is a kind of physics that defines relationships between the prime mover and his (?) bipedal subjects imbued with mystical sensitivities. It claims to define the outcome of the disposition of a soul, whatever that may be. I don’t even believe in the existence of the mind, much less a soul. As a form of physics, religion lacks means by which theories can be tested. Quantitation of a spiritual element is an idea that has yet to see practice. It seems to lack predictive capability to estimate an outcome that can be validated. It is definitely not a science. It is not about matter or energy. It is about how to conduct ones life against a backdrop of divine authority and within a box of behaviors. But our brains seem to be constructed in a manner such that religious/spiritual notions are nearly irresistible. Billions of people have claimed to feel its draw and testify to its merits. The projection of anthropomorphic imagery in myth is common in diverse cultures. The Abrahamic religions congealed from cultures that were apparently unaware of the concept of zero. Where heaven is death with a plus sign, hell is death with a negative sign. To an atheist death is just zero. It has no sign or magnitude. It is unconsciousness and devoid of the awareness of pain or pleasure. Zero sensory processing. It is neither exaltation nor agony. Just zero. Entropy prevails. Such an outlook is hardly appealing enough to gather followers. It is grim and without hope of graduation to eternal bliss. The take home lesson is to live in the moment, not the future. Who am I to argue with millennia of religious thought? I don’t know. All I can say is that even as a cancer patient, I remain refractory to the pull of religious and mystical thinking. So it was and so it is. Divinity students! Relax. I’m no threat to your faith. My conclusions on this life of ours offers no ceremony and precious little fellowship. I can say that I’ve had an eye-full of the clockwork of this universe. Adherence to evangelical doctrines could not have provided the amazing insights. And for that I have no regrets. Tempest in a Teapot. Philosophy-v-Physics. A minor snit has broken out between outspoken physicist Lawrence Krauss of Arizona State University and, well, the philosophers of the world. Krauss has become a darling of the cable TV world of NatGeo and the Science Channel. It seems that you can’t swing a dead cat without knocking over the same dozen television astronomer/cosmologists and quantum physicists. This rotating crew of scientists are filmed on various locations straining to explain the universe in terms of string theory, dark matter, and quantum wierdness using language with a Fog Index of 8 or less. I’m not slighting these folks in the least. Using the English language to convey the essence of these concepts is difficult, as is preventing the reflexive use of the remote control by viewers with the attention span of a house cat. Anyway, Krauss has managed to inflame those philosophers who pay attention to popular science. His latest book, A Universe from Nothing: Why there is Something Rather than Nothing, has precipitated this argument. I don’t care about the merits of his argument here. The reader is invited to dive in. What I am writing about is the social and intellectual mistake Krauss made. Like all physical scientists, he is a reductionist. The drive for a ToE, Theory of Everything, is the ultimate act of reductionism. His assertion that philosophy is obsolete in the face of discoveries in physics and the emergence of big subassemblies of a ToE has been received with dismay by philosophers. A large fraction of people (adults, anyway) are hardwired to be receptive to mysticism and no amount of handwaving, no matter how logical and crisp, is going to cause the bell curve to skew substantially away from cherished mystical beliefs. Krauss has fallen into the same trap as those in the 19th century who may have declared that physics was pretty much complete with Newtonian mechanics. While quantum mechanics provides a template for the description of how particles behave constrained to a region of space, it fails as a replacement for philosophy. That is, quantum mechanics and cosmology do not provide any concise analysis on how people should treat each other, how to conduct a worthwhile life, or how to interpret what the meaning of quantum mechanics is in your life. This is the realm of philosophy and religion and these kinds of questions must be freshly examined by each generation born into this strange universe. The meaning of existence is not yet settled science. In solidarity with yesterdays protest against internet censorship, my porch light remained dark last night. What is normally a shining beacon of hope in the neighborhood was last night a mute and dark void. This pocket of frigid darkness sat in silent protest to those who would presume to stunt the billion webbed neurons of this nearly-sentient being we refer to as The Internets. So it was and so it shall be. Our next play, Dearly Departed, is in production. I play a character named Royce. This part has some pretty good lines. I’ve always played some fairly minor characters. The trick is to always do your best no matter what the part. A play is an ethereal being that lives for about 2 hours and then folds into a mere memory. The job world is sort of like that too. You might find yourself in what appears to be a minor part in a large production. You get upstaged and your lines are walked over by the main characters. But the main characters are carrying larger risk. If they flub their cues or mangle their lines, the effect is commensurately larger. On some projects you definitely don’t want to be the leading character. What is critically important is that you play your part the best way you can, show up for all of the rehearsals, and most importantly, pay close attention to what the other actors are saying and doing now. The best actors are always in the moment. Here is an interesting post called When Chemists go to War. It is a good reminder of how our work can be taken to places where we ourselves wouldn’t go. Ever develop chemistry that has killed someone? What would you do if you developed a substance that was used for destructive purposes? Would it bother you? Some scientists from the Manhattan Project were troubled by their work on the bomb, but others slept quite well. I suppose it could be considered similar to the situation with the inventor of the baseball bat. Could this inventor have forseen the use of the bat in committing violence? Probably didn’t cross his mind. But if you’re inventing new military explosives, how do you cope with the knowledge that your invention’s use is specifically for more precise application of killing power? The fact is that there are many scientists who have no difficulty with this at all. I’ve met a few of them and they are very sober folks. They know exactly what their invention does and they are eager to do even better. I think it is this ability to stand behind the abstract technical details, sheltered from the blood and guts reality, that allows scientists to rationalize their work on killing technology. Scientists will never have to carry with them the olfactory battlefield memories of bomb smoke and shredded bowel. Weapons labs are relatively safe places to work. The weapons scientists biggest hazard, realistically, is the commute to and from the lab. Perhaps weapons designers and munitions manufacturers should have to clean up after a car bomb or carry bodies from the scene so as to emphasize the exact consequences of this work. Maybe the most important thing we can do to honor soldiers lost and wounded in battle is to resolve that we will produce fewer dead and wounded soldiers. One approach embraced by many is to make war more effiicient and more automated. Send machines into battle rather than people. The other approach is to be a bit less warlike. Throttle back on weapons spending. Take the view that war isn’t really glorious, but rather that it is an uncivilized duty we are called upon to do on occasion. Amassing huge armed forces presents the temptation to use them. The goal for our national leaders should be … lead us not into temptation. So it turns out that I am the family atheist and liberal. The social awkwardness and philosophical incompatibility of this condition was evident the other day in a discussion with a family member that diverged into a shouting match. In fact the immiscibilityof my liberal atheist proclivity with my family’s generally Christian conservative foundation has severed ties with a few family members outright and distanced others. My father, deceased nearly a decade ago, never reconciled with his son’s atheism. In his view, it was a choice inevitably resulting in existential tragedy and damnation into the darkest recesses of infinity. My wife is a Methodist and our kid is being raised under that umbrella. I have taken the position that I will not indoctrinate my child in the analytical consequences of atheism. Rather, the adoption of a philosophical position on existence is a self-guided adventure everyone is entitled to. Whether one is lead deep into the doctrines of the Abrahamic religions, eastern philosophy, or the uncertain swamp of agnosticism, it is the right of all people to come to their own conclusion on the matter of ones place in the cosmos. I claim that this is a right. But many otherwise liberty-loving people disagree. They view indoctrination into the religious fold as a kind of rescue. It is a dash across the finish line that must to happen well before death to ensure that the soul is channeled into the chute leading to paradise. Once in this enviable condition, the ethereal community of souls can eternally heap praise upon the diety directly rather than across that impenetrable supernatural discontinuity that is resistant to all but the force of prayer. Or so goes the core theory of the Abrahamic religions as I understand them. To many religious followers, the very fact that their religion is ancient seems to validate the accuracy and veracity of their ideas. The mere continuity of these doctines seems to confer some hopeful message about the vital truth of the doctine. But I would counter that what continues over time is not the cosmic accuracy of the idea, but rather the psychological consequences of brain physiology. Architectural features of the brain and the behavior of neurons therein have produced self-awareness. The self-aware brain enables much possibility for an organism. An effect of our self-awareness is that we come to experience time. But the very familiarity of self-awareness of the human brain might lead it to assume or calculate that self-awareness is a common condition in the external world. It seems to easily conclude that the apparent organization of the world was conducted by a central organizing influence- a diety. Moreover, it is not unreasonable for the self-aware brain to assume that it’s own self-awareness is part of a continuum of awareness or consciousness. The notion that self-awareness might extinguish would be inconceivable. I think what the ancient religious texts and doctrines convey is a kind of familiarity. It is a shared experience of mystery, uncertainty, and fear through the common experience of consciousness. The brains of our ancestors communicated through the agency of language their chronicles of hope and fear to our brains which share the the same strengths and weaknesses. It is this commonality that rings the bell of truth in our self-awareness. It reinforces the mystical experience as a physiological experience because it is fundamentally that. What is inevitable about our self-awareness is extrapolation. Religion soon mutates from a personal mystical experience to a theory of physics and politics. This is what I cannot accept- Religion as a political template or as a ToE (Theory of Everything). Many people come to value alignment to doctrine as a higher calling than the application of love and charity to their fellows who have lost their way or have experienced bad luck or tragedy. I would offer to the reader that what makes a person liberal is the priority choice of people over the politcal doctrine of social Darwinism. We in the USA have confused economic theory with reality. Economics and business are a subset of sociology. The alleged congruence of economics to morality or metaphysics is a political theory some people have asserted because it serves their purpose in the allocation of wealth. It’s a part of their ToE. And I’m here to say that some of us can see what they’re doing. At some point a person has to decide that he/she is involved in enough activitites in life. This uncomfortable world of overcommitment is where I have been for a while. I’ve come to the realization that my consciousness has limited bandwidth and that intellectual stimulus can overload it in ways that are hard to recognize. Having been born with lots of curiosity, I find myself piqued by a great variety of things in the universe. The sciency stuff is obvious. But there are other things that can consume much of my capacity for attention. It is much like an addiction to a drug. One soon becomes accustomed to a high baseline level of stimulus. As boredom sets in, the brain seeks greater stimulus. I can’t bear to wait 5 minutes without something to read. Cable television and the internet takes full advantage of this. Last weekend I found myself totally immersed in the Free Electron Gas theory of metals. As I was wrestling with the math my family was out shopping and having fun. I was having fun as well, but it was of a more cloistered form. Was I being selfish? I think the answer is yes. So, this life of intellectual pursuit can spin into a solitary life. I like to joke that some days I’m misanthropic and other days I’m very misanthropic. That’s not exactly true, but I will say that my patience for unstimulating conversation is limited. It comes down to the fuzzy boundary between ambition and obsession. It is very easy to slip into a condition that is referred to as eccentric. I can see how it happens. Maybe it is too late. Th’ Gaussling’s 14th Epistle to the Bohemians. Enjoy the Ineffable. Here is a great title for a post- “Effing the Ineffable“. I wish I’d thought of it. The author, Roger Scruton, a philosopher, attempts to circumscribe the indescribable and unquantifiable by revealing those who have tried to describe the ineffable. His conclusion is to relent and accept it. Having a brain and sensing the external world means that our sensory apparatus and our internal private monolog are interpreting a continuous stream of perceptual input whose format is based on the constraints of molecules and molecular orbitals. Is it possible that this organic object- the brain- is capable of a broad enough spectrum of perception that it can understand its place in the universe? Scientists are reductionists by nature. Scientists naturally seek an irreducible representation of a phenomenon and attempt to describe it symbolically. The symbols may be words or mathematical constructs (what ever it takes to get through peer review). I think where scientists are not so welcome is in the aesthetic domain of the human experience. Perhaps our place in the universe is simply to be the conduit through which the broader universe is self-aware. We sentient beings should enjoy that role and have some fun with it. My morning commute through the countryside takes me past more than a few fields of sunflowers. By late July the flowers are out and without exception, all nodding toward the east where a star appears every day. 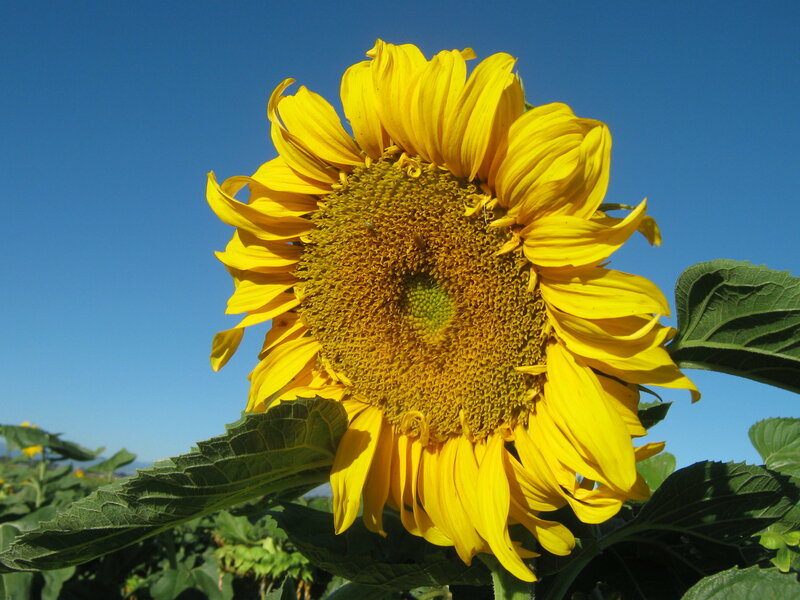 Many of the local farmers have taken to raising sunflowers rather than the usual corn and sugar beets. I haven’t a clue as to what kind of machinery is used to harvest these things. It is uncanny that the entire crop will lock the flowering body orientation in the direction of the sun. Somehow the direction of the sun at other times of day does not randomize the orientations. If you stand and look at a field of sunflowers, you’ll see outliers in height, but not direction of flower orientation. Or so my experience has been. There has to be some frequency of orientation outliers. I wonder if there isn’t some growth step in the stem than occurs over a short time span X days into its growth, removing what stem mobility that might exist and locking the flower in place? Such things make me wonder if our concepts of consciousness, with human consciousness as the benchmark, aren’t a bit too self serving.